Do you have a January Birthday?? Well, treat yourself to some garnet jewelry! Here at deBebians, we have garnet jewelry in lots of different styles. We have garnet eternity rings, five stone garnet rings, garnet and diamond station necklaces and even garnet and diamond floating halo earrings! Garnet is a beautiful gemstone, scores about 6.5-7.5 on the Mohs scale, and comes in a variety of colors. Included in the garnet group is almandite garnet, andradite garnet, grossularite garnet, malaia and color change garnet, pyrope garnet, rhodolite garnet and spessartite garnet. Wow! I sure hope I didn’t leave any out! Here at deBebians, we sell garnet and rhodolite garnet jewelry. Garnet is the typical brownish red and is very commonly used in jewelry. Rhodolite garnet is a more purplish red to reddish purple color and some clients prefer this look more. Both are gorgeous and quite popular especially for January birthdays. I love five stone rings especially when they are alternating diamonds and colored stones. With this ring, you can choose from the classic shared prong setting or you can mix it up with the U prong style. 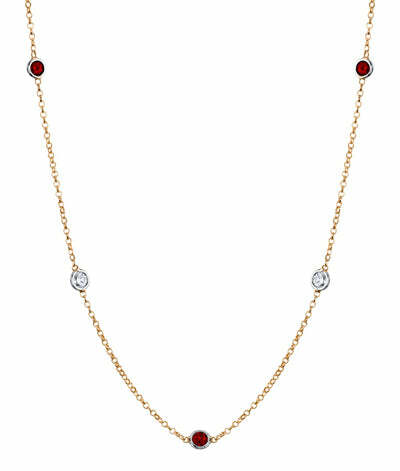 This garnet station necklace also features alternating diamonds and garnets. Yellow gold really brings out the color of the garnets. This is a gorgeous gift for any lady with a January birthday! 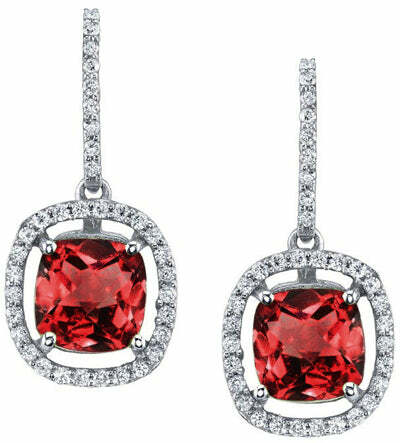 These garnet halo diamond earrings are fabulous! Halo jewelry is everywhere and adding a pop of color really makes them unique. If you need help selecting a January birthday gift, be sure to check deBebians. 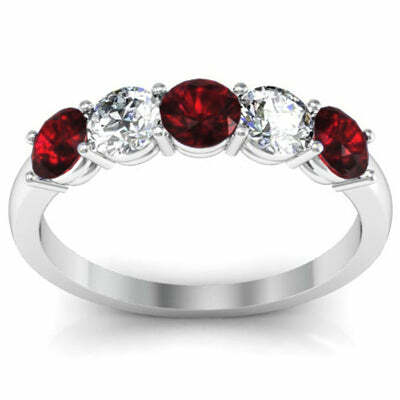 We offer lots of beautiful garnet birthstone jewelry. There is sure to be something for everyone’s taste.